Shortly before my trip to Palembang, a curious coworker asked me why I wanted to go there. At first I struggled to come up with a decent answer. I could have mentioned the city’s long history, and how it was once the capital of a powerful maritime empire. Or I might have told her about the traditional textiles known as songket, woven with delicate strands of shimmering gold thread. Instead I latched onto something she could relate to as a Hong Konger: “The fishballs [fishcakes] there are very famous,” I replied. According to local lore, the fishcakes of Palembang were invented sometime around 1617 by an enterprising elder in the Chinese immigrant community. 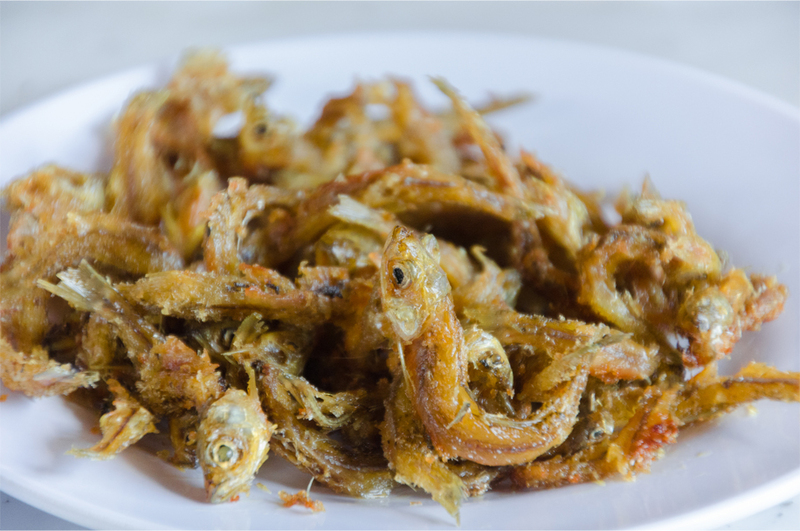 At this time the fish from the Musi River was only fried or salted, and with much of the leftover catch going to waste, he decided to try something new. 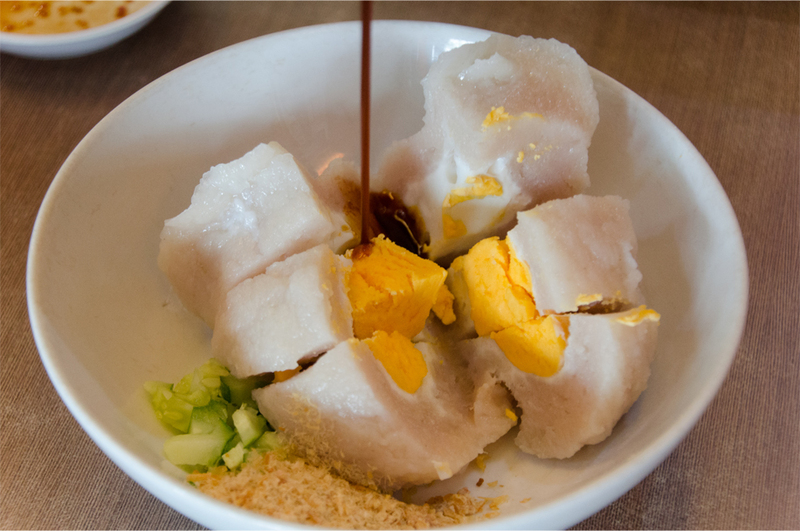 The old man moulded minced fish and tapioca – starch extracted from the cassava root – into balls of dough, cooking them in a pot of boiling water. When he wheeled these new creations around the city, Palembang residents called him “Pek-apek” after the term for an older Chinese man (apek). 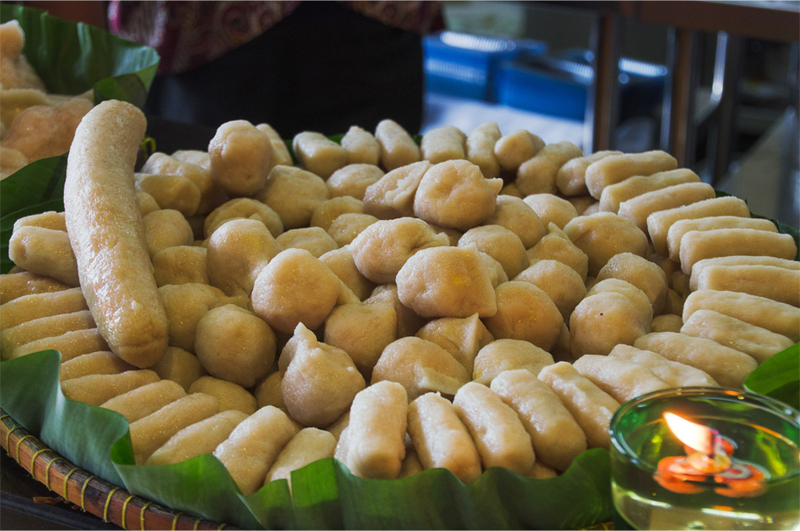 The name caught on and the fishcakes he sold became known as empek-empek or pempek. 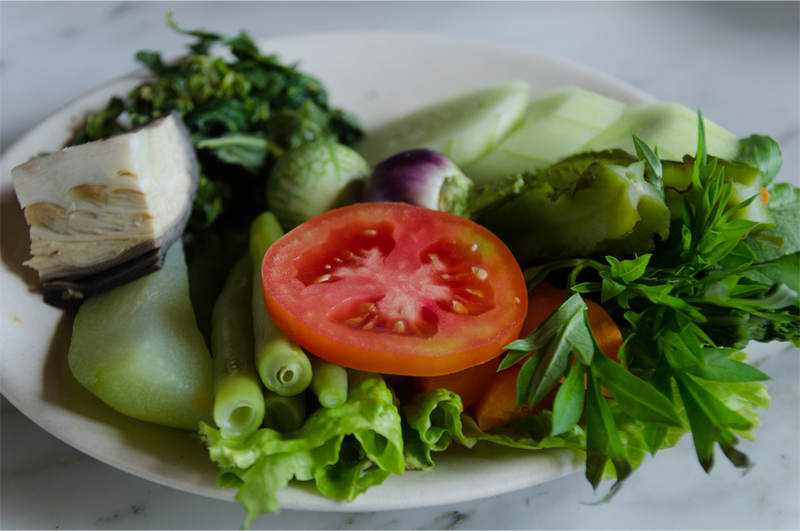 For many Indonesians, the dish is emblematic of Palembang in the same way that sushi is associated with Japan. 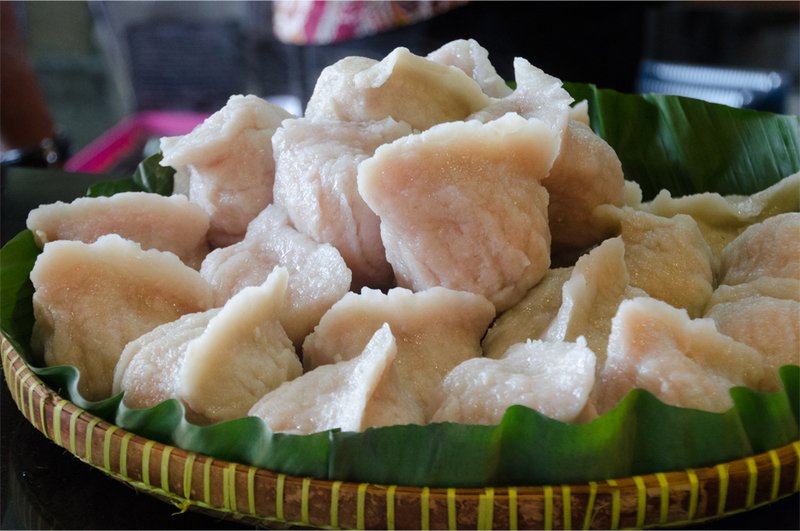 Pempek today has at least 15 different varieties: one contains minced young papaya (pistel); another is stuffed with tofu (model); while yet another kind resembles a ball of tightly packed noodles (keriting). 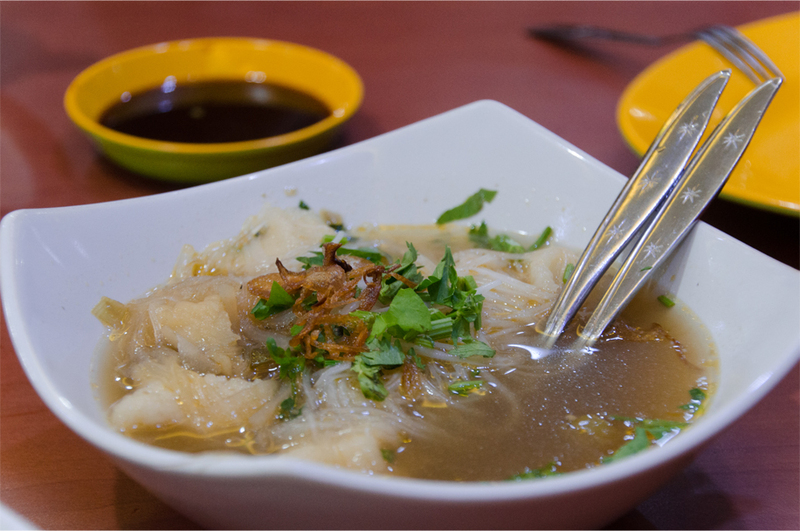 Pempek can range from bite-sized fishballs (adaan) to dumplings larger than a fist (kapal selam, literally “submarine”). After the early morning flight from Jakarta, Bama and I settle for breakfast at Beringin, where the pempek is piled high on rattan platters lined with banana leaf. Bama orders a hearty egg-filled kapal selam for each of us and a plate of smaller kinds to share. Each table comes equipped with a pitcher of a rich, dark sauce called cuko. 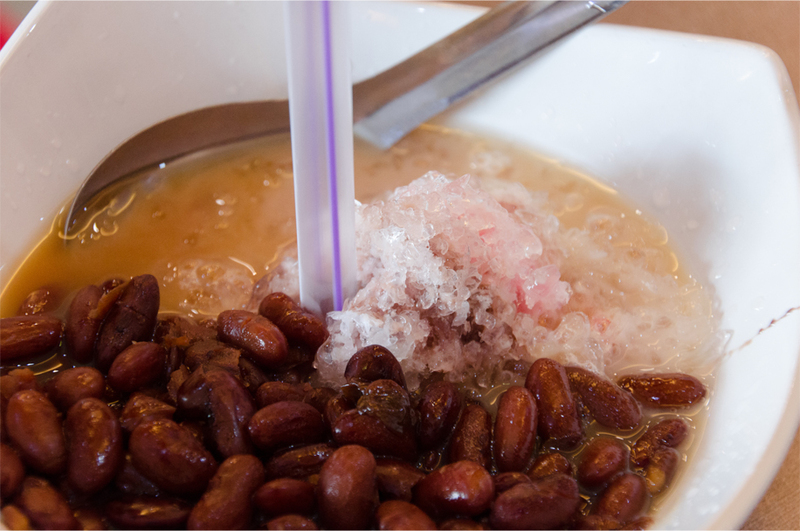 I carefully pour out some cuko onto my spoon to taste. It is simultaneously sweet, sour and spicy; tickling my taste buds with a lingering heat that starts off innocuous but gradually builds on the palate. 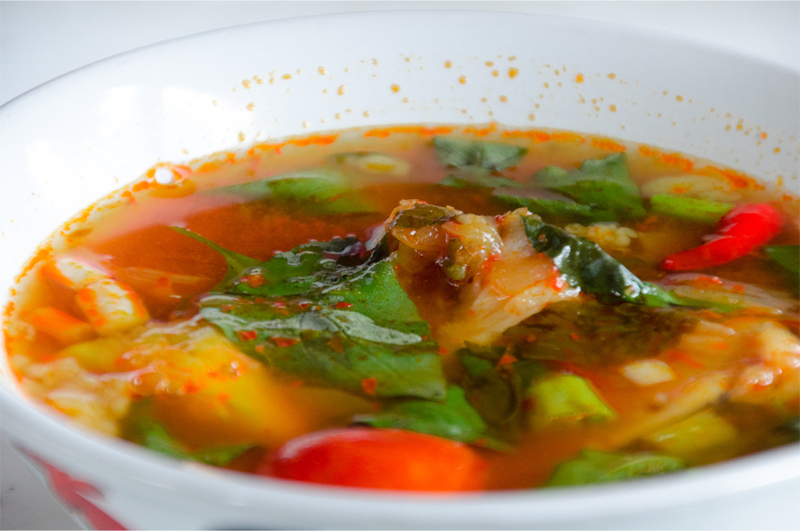 Cuko is essential for imparting the mildness of pempek with an addictive blend of strong flavours. 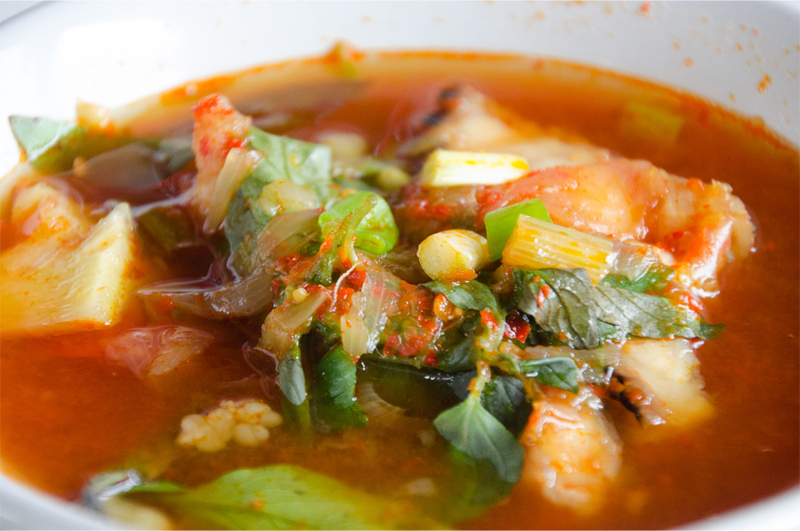 Among its chief ingredients, you’ll find palm sugar, chilli peppers, vinegar and garlic. mie celor is the best! i’m glad you enjoyed your stay in Palembang. It’s a very nice and “provocative” posting James. I am mouthwatering now. I shouldn’t have read this post, haha..
Maaf Wien, haha… maybe I should have published it right after lunch instead. Iya, kuliner Palembang enak sekali. Untuk saya itu pertama kali mencoba mie celor dan pindang. I read this post with Annie with a hope that she can make some of the dishes you mentioned in the post. 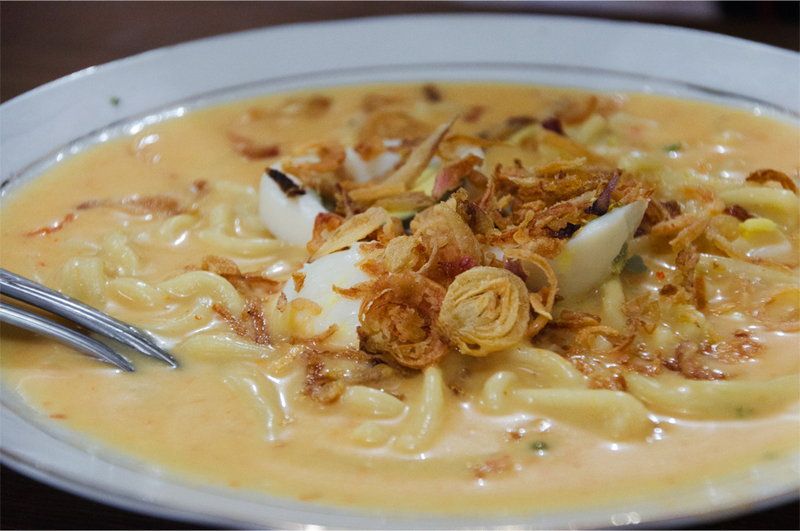 Unfortunately, she is from Jawa Timur which is very far away from Palembang >.< The noodles mie celor looks super yum!! It’s a shame we can’t find these dishes anywhere in Hong Kong – I would love to eat another bowl of mie celor! I would love to try too! If Annie finds out how to cook it one day, I will let you know! ¡Excelentes platos James! No hay como conocer las culturas a través de los sabores de su gastronomía. Muy interesante el artículo y tienen muy buena apariencia los platos. ¡Gracias Jorge! Estoy de acuerdo, para mí la gastronomía es una de las mejores partes de cualquier viaje y una ventana a la cultura. Pues he recibido el mensaje que enviaste unos meses antes, pero me olvidé completamente de responder. ¡Te pido perdón! Totalmente de acuerdo con tú comentario. Por lo del otro mensaje, no te preocupes, yo soy el primero que va de un lado a otro con mil cosas y me dejo algunas por hacer al no darme abasto. ¡Más que perdonado! ¡Un abrazo! I agree… the food in Palembang was something special! I would want to try all that scrumptious looking food even if I weren’t hungry!! Scrumptious is right, Marilyn! I wouldn’t mind having those noodles on a regular basis. Love your photos and descriptions…you are making me homesick! We are have been nomadic for almost two years, mostly in Asia. Here we are in Chicago for a few months to be near family. All well and good, but am missing authentic original Asian food. Can’t wait to be “on the road” again…thank you for this awesome read. It’s my pleasure, Peta. Thank you for those kind words and that message you sent me. You and Ben are an inspiring pair – someday I’d love to embark on that same kind of nomadic life! Chuckling at your response to your co-worker 🙂 The Mie Celor looks like something I could live on! Thanks for the tips, Dedy. Your recommendations give me more reason to revisit Palembang in the future!